As soon as possible, he wants to hold a meeting with the Land Use Committee and other citizens in the county in which a representative of G.P.’s Enterprises Inc. of Auburn, Ga., which won the bid for the construction work, answers questions about the construction plans and process. “There is a lot of community interest in what are we going to see, how are we going to see construction progress,” Beshara said. It is much more challenging to upgrade a road than to build a new one, Beshara told the Committee, because of the need to maintain traffic on the existing road during the construction. The construction will result in intermittent lane closures during the construction, Beshara said. At one point–probably for 24 hours and probably on a weekend--the road will be closed at a point where a box culvert will be installed under the future roadway. At that time, traffic will be able to travel to the construction site but will not be able to proceed further north or south. Beshara said G.P.’s will work around the school schedule, with the majority of work at Oconee County Middle School occurring during summer vacation. The sole new traffic light on the new Mars Hill Road will be at the school, Beshara said, and the county had to work hard to get the Georgia Department of Transportation to approve that addition. Beshara said again that residents most likely will see the first signs of construction at the north end of the project where Mars Hill Road crosses Barber Creek. The roadway will be raised about seven feet at that point, and two new bridges will be built. This part of the project also will take the longest to complete, he said. Almost everywhere along the project, which runs from Butler’s Crossing to SR 316, the new, four-lane roadway will be higher than the current two-lane road. G.P.’s will need to import more than 300,000 cubic yards of soil to make that possible, he said. The construction will be “painful for the people that expect to get from Butler’s Crossing to 316 on Mars Hill in the same amount of time it takes them today,” Beshara said. People need to be patient, he said. Beshara has given periodic updates to the Land Use Committee as the Mars Hill Road project has progressed. The most recent one had been in June. At the meeting last Tuesday, Beshara also discussed proposed road projects on Daniells Bridge Road and Jimmy Daniell Road. 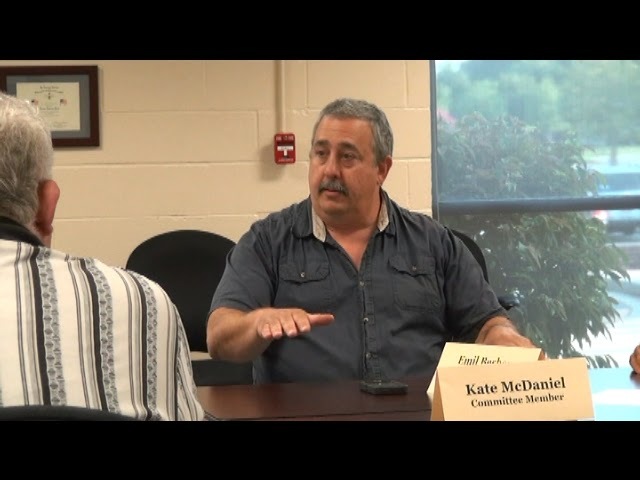 The video below, which runs a little more than 15 minutes, contains all of Beshara’s comments on Mars Hill Road at the meeting last week, held in the Community Center of Veteran’s Park. Does anyone know if any homes are being torn down by the Mars Hill widening project? I can see that the marking flags come within inches of the sides of the homes along Mars Hill, especially around the Brookwood Estates area, and the Windy Creek Subdivision. What if anything is being done regarding the sound/noise impact from a 4 lane hwy, for these residents? I am also concerned about those of us living in Windy Creek that will have only one left turn access point onto Mars Hill. With only one additional traffic light in entire 4 lane expansion, the new road will likely produce increased speeds. A left turn will only become more dangerous.